A terrific outdoor wicker set that can be used inside in a four season room or on your patio without any worries. Set includes two chairs, a love seat and coffee table. 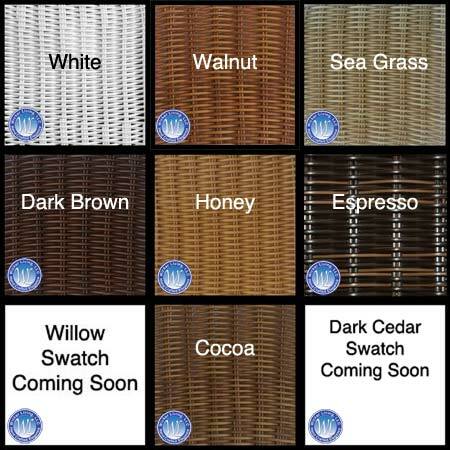 Quality aluminum frames wrapped in quality resin wicker weave and designed with lattice to make this item special. Allows your body to breath in the hot days of summer and provides an aesthetically pleasing character to your decor. Adding optional deluxe custom made cushions will top this set off complementing your decor. Choose colorful fabrics from your extensive line and complete your color finish selection.